Yes, I know. I havent posted in literally months. I was so excited about the prospect of blogging Ballymaloe Cookery School – and when I got there, I was quite good … but suddenly … I was just immersed. Its not that I didnt have time – it was just that there was so much going on internally and externally, that I needed a moment, every day, to just be. And unfortunately, that moment that I took for myself on a regular basis, would be the moments when I would have, should have, blogged instead. Apologies. To you, and to myself, for not having documented this extraordinary experience as it was happening. But it was so deep, so life-changing that … to be honest, I didnt have the words. However, I took loads of photographs … and over the next few days, I will go over them, and share some of my most special Ballymaloe moments with you. As for now … I am sitting in Provence, in the golden sunshine, at the home of my dear friend… and I am cooking in a brand new way. I learned so many techniques at Ballymaloe which enriched the way I cook, and also the way I see food. Nothing goes to waste… a grapefruit eaten for breakfast gets considered, and the peel gets turned into candied fruit. Stale bread becomes breadcrumbs. And raspberries, which were fresh yesterday, but might not be utterly perfect today, get turned into raspberry jam. And thats what I made today. Raspberry jam – dark, deep, so delicious slathered on a fresh croissant, perfect and bursting with the sunshine and the fruit. And simple beyond words. To make this jam, you need equal parts fruit and sugar. And thats it. Yes, its really that simple. You can tell that jam has set if a little of the jam spooned onto a cold plate sets into a wobbly sort of solid consistency. You can draw a line through the jam with your finger, and the line stays. I poured the jam into a little pot (gorgeous isnt it? It was a yogurt pot from the supermarche!) and set it down to cool. And then I decided to write. I am glad to be back. 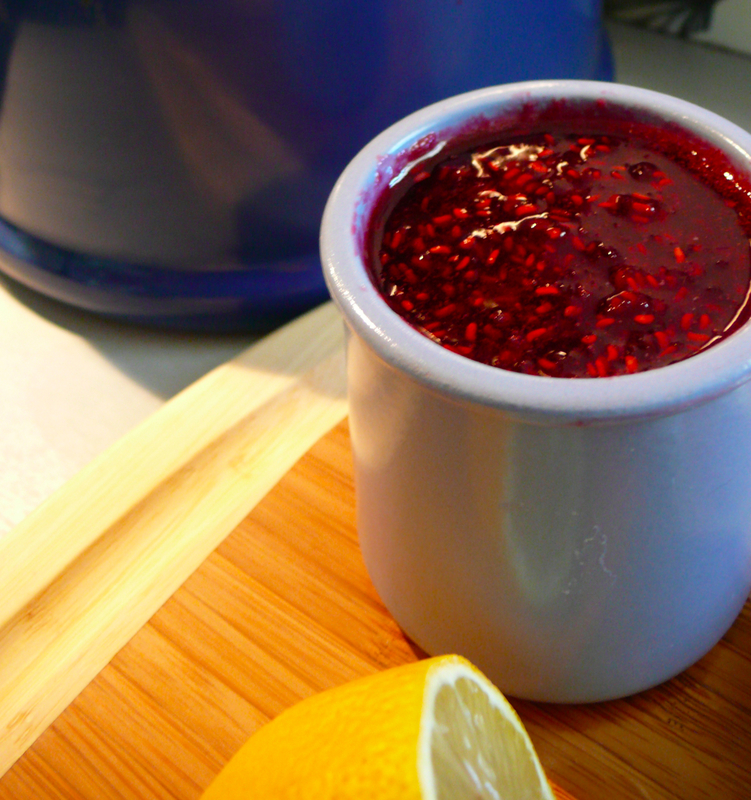 If you have a few berries, consider making some jam today. Fresh jam is like nothing else, and it really takes only a few minutes.